If you suffer from chronic neck pain, you understand the impact that these symptoms can have on your everyday life. Activities that were once simple, like driving or doing household chores, are now sometimes impossible due to the shooting pains and limited mobility in your neck. If you’ve been enduring this pain for a while now, you may be concerned that surgery is your only chance to find relief. However, surgery is not the only treatment option for neck pain. Physical therapy has been shown to help relieve symptoms of chronic neck pain and promote cervical spine (neck) health. 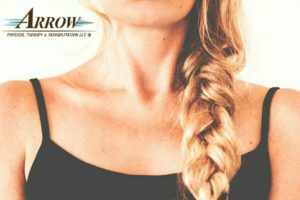 How does physical therapy help treat neck pain? Physical therapy is recognized as a recommended treatment for chronic neck pain because it targets the cause of the neck pain to provide lasting relief. Neck pain can typically be attributed to a pinched nerve in the cervical spine, which can be caused by injury, muscle tightness and inflammation, or general deterioration of the spine, among other causes. Physical therapy helps relieve pinched nerve pain by improving the health of the muscles and bones surrounding the pinched nerve. Stretching – Certain neck stretches help relieve chronic muscle tension and inflammation, which could be the cause of your pinched nerve. Exercise – Strengthening the muscles around the spine can help reduce the pressure on the spine, which can free the pinched nerve. Lifestyle changes – A physical therapist can identify lifestyle changes specific to you that can help you avoid recurring neck pain. In addition to physical therapy, you can also talk to your doctor about other nonsurgical treatments for neck pain, which may include pain medication, yoga and massage therapy, among other options. If you’re ready to stop living with debilitating neck pain, contact your nearest physical therapy office and schedule an appointment. If you are in the Edison, Union or Woodbridge, New Jersey area, our Arrow Physical Therapy offices are ready to help you get back to the life you enjoy by offering personalized neck pain treatments. Over the past several years, we have won numerous awards for our excellent patient service and outstanding treatment. Contact us today to schedule an appointment.